Police have traced two of the four drivers believed to be involved in a hit-and-run which killed a 29-year-old woman in south London. 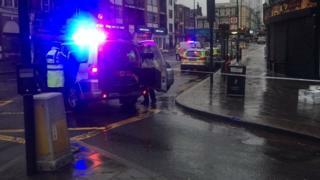 The victim was struck by a lorry as she crossed Norwood Road, in Tulse Hill, on 11 December. She was then hit by a second lorry and two cars and died of her injuries. Police say none of the drivers stopped at the scene. Two men, aged 49 and 52, have been interviewed by detectives. Det Sgt Alastair Middleton, of the Metropolitan Police, urged the other two drivers to speak to police. The Met is also seeking any dashcam footage from drivers who were in the Norwood Road area between 06:30 and 07:00 GMT. Officers say the woman from Wandsworth was crossing the road while the lights were green for traffic when she was initially hit at 06:48 GMT. Of the two drivers who have been tracked down so far- the 49-year-old man, who was the driver of the first lorry, was interviewed under caution. The 52-year-old driver of the second car was arrested on Tuesday and subsequently released while inquiries continue.